Create memories to last a lifetime. This is the perfect gift for new parents. The 1PORTRAIT studio session runs for up to one hour. Receive a 7x5inch print mounted and supplied in a hand-made wooden frame. This time can be used to photograph a variety of different setups, i.e. newborn baby, with siblings, with parents, grandparents etc. Founded by award winning photographer Bryan Brophy, 1Portrait specialises in photographing babies, children and families of all ages. Use this voucher on AllGifts.ie to make a booking with 1Portrait. Or you can order a 1Portrait voucher for delivery by post and make a booking directly with them at a later date. 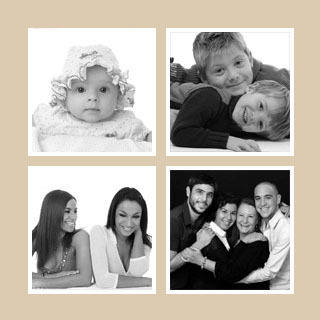 1Portrait photographic studio is based in 51 Knocklyon Road, Dublin 16.